Note: This article is for an older version. For the current version see this article. If you already have records in a digital format, they can usually be imported to Bird Journal, avoiding the effort of typing them out again. 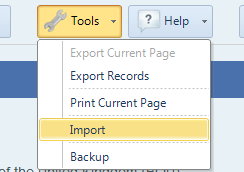 Note that the ability to import records is currently only present in the Windows desktop version of Bird Journal. This is something we plan to change very soon. You first need to gather the records you wish to import into Bird Journal as a file. This is typically either as a CSV (comma separated text file), XLS (Excel 2000 and later) or XLSX (Excel 2007 and later) file. If your records are in a custom format, then they will need to be modified to match the layout of one of the supported formats. For the UK we recommend using the Wildlife Recorder format and elsewhere we recommend using the eBird record format. Download the appropriate template and modify a copy of your records to match the structure of the template. If you don't have the required information for a column, then just leave it blank - Bird Journal is fairly flexible about what you need. If you have scientific name, but only together as a single field, then just leave Genus/Species/Subspecies columns blank. Bird Journal will match against the common name, and allow you to confirm which species you mean if no matches were found. 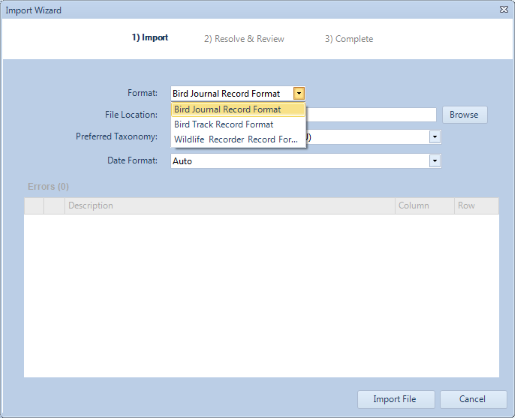 Once you have a suitable file with your records, it can be imported into Bird Journal. Click Tools > Import. You will see the Import Wizard screen. 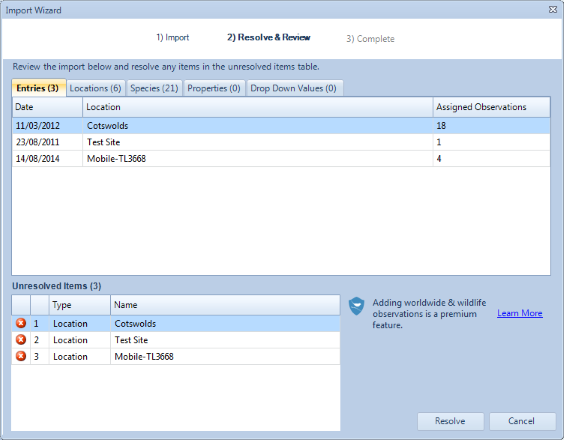 First, select from the format box the format of the records you are importing. Locate the file to import by clicking the Browse button. Double check the other options are sensible (if enabled, that varies depending on the format), then click Import File. Note that if you do not see the format you wish to use, most likely it is not installed. To install it, first visit the Library screen, find the Record Format that you wish to use, and click Install. If there are errors, they will be shown at the bottom, hopefully with enough information to help you fix the problem. If the import was successful you will see the Review & Resolve screen. Here you can double check what will happen during the import. 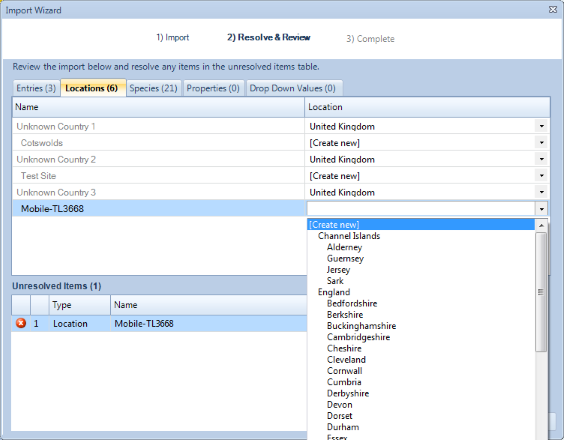 Bird Journal will match text in the imported file with the names of locations, species and properties in your journal. Where possible, Bird Journal will do this automatically, however there may be cases (especially if you already have records in your journal) where it is not sure what you would like to do. For example, Cambridge in an imported file, may refer to Cambridge in the UK or Cambridge in the US. Items that need your attention are surfaced through the list of unresolved items at the bottom of the screen. You can double click on any of those items to be taken to the relevant section where you can tell Bird Journal what to do. In the case shown above, double clicking on the third item, will open the Locations tab, where [Create new] can be selected. This instructs Bird Journal to create a new location for this, rather than mapping it onto an existing location in the journal. As items are resolved, they are removed from the list. Properties in Bird Journal allow the import of many custom fields, in a what that they are conveniently editable and searchable. Existing properties can be used where appropriate or new properties can be created. Be sure to select the best type of property, eg. TextBox, DropDownList or CheckBox. It is also possible to assign properties to both individual observations and the whole entry, so you'll want to make sure you use the most appropriate. Once all items have been resolved you can click the Resolve button in the bottom right corner, and the records will be imported. They will then by synchronized and become available to view on other computers or devices signed in to the same Bird Journal account.